The V1B Pop up power point is an Australian first, revolutionising the way we have power in our kitchens, desks, and offices. The V1B socket features 2x Australian standard power points which can easily be hidden or pulled up when needed. It also features 2x USB charging ports providing 2.1amps of power @ 5v capable of charging iPads, iPhones, iPods, Android Phones, GoPros, Digital Cameras, and pretty much any other device which requires USB charging. That’s why MPS pop-up power points are revolutionising the way we access power in our kitchens, offices and other spaces. The days of searching for the perfect power solution are gone. Charge multiple devices simultaneously, quickly, simply and neatly with convenient Australian standard power points and USB charging ports capable of charging most USB charging devices. Featuring a slim and compact design, the V1 is sure to set your space apart. The MPS “V1” Pop-Up PowerPoint is simple to install. A hole with a diameter of 85mm is required in the desired installation surface. The unit can then be fitted to the hole and plugged into a standard power point underneath the bench top surface. The unit is then ready for immediate use – No professional help required! 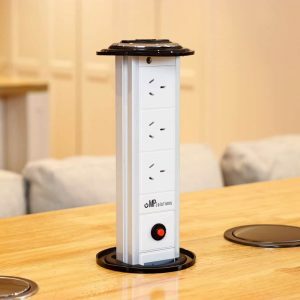 This type of pop-up power outlet is designed for offices, workshops etc.. This model of pop-up power point is not recommended for installations in kitchens. As the unit has no water-resistive capacity and will fail if water is present. A. We reply to 98% of customer emails within 24 hours, and we work to resolve each of them as soon as possible. We are based in Australia and are easy to deal with. You can contact us via phone – through our ‘request a callback’ feature, where you give us your name and phone number, and we ring you back as soon as we are available too, within 24 hours. A. Yes, we have tested and certified all our products to meet SAA standards in Australia. Our test reports and certificates are available on our website. Q. What is the required distance this unit must be when installed from an active water source such as a tap? A. There are various ways you can contact us. You can email us – we generally reply with 24 business hours or you can speak to us over the phone. Click here to send us you name and phone number, and we will call you back as soon as we can [within 24 hours].